ATTACH TWO ACCESSORIES LIKE A CAMERA AND MICROPHONE WITH THIS PRO SMARTPHONE TRIPOD MOUNT – Connect smartphones from 2 1/4 to 3 5/8 inches wide to your own tripod. 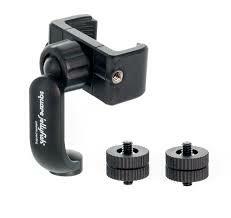 Two accessory adapters included to attach your camera and microphone. HOW OUR TRIPOD MOUNT IS DIFFERENT – Named an ultimate must have Instagram and podcast compatible accessory. Our STURDY heavy duty clamp and soft touch rubber cradle firmly holds your phone in place without scratches. VETERAN OWNED COMPANY BASED IN THE USA – All Square Jellyfish products are designed in the USA by our engineers to work simply and last forever. Most of our employees have been with Square Jellyfish for 10+ years! BUY TODAY RISK FREE LIFETIME WARRANTY – We are firmly committed to standing behind our products. If you are not happy with our products, let us know, and we will not rest until we solve the problem. We are here to help!